Quinoa...what is quinoa and how the heck do you say it? I get asked this all the time! "Keen-wah" (quinoa) originated in the Andean region of Ecuador, Bolivia and Chile. It is a grain-like crop that is grown for its edible seeds. 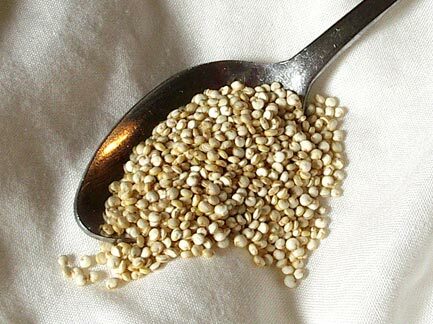 Quinoa has a very high protein content (18%) and a complete source of protein. It is a good source of dietary fibre and high in iron. I really enjoy quinoa, I even ate it for breakfast the other day! It makes for a great base to any type of salad flavourings (like Greek! ), and now even a breakfast vehicle for flavour. This recipe I want to share was made for me by my friend Katie one night when she came for dinner. I absolutely loved it, and now offer it as a salad choice to my lunch clients. 2. On a roasting sheet, place the butternut squash and coat with olive oil, salt, pepper, cumin and sage leaves. Roast for 30 minutes, until tender. 3. In a saucepan, bring 1 cup of water and 1/2 cup of quinoa to a boil. Add in the garlic. Reduce to a simmer, cover and cook until the liquid is absorbed. About 12-15 minutes. 4. Once quinoa is cooked, mix with the butternut squash, add in the orange juice, adjust seasoning and serve warm.